The canonical Wnt receptor signaling pathway is a series of molecular events that are initiated by the binding of Wnt proteins to the frizzled family of receptors on the cell surface. This ultimately activates transcription factors and results in changes to the expression of target genes. β-catenin is a key protein in the Wnt receptor signaling pathway, and through its role in cell-cell adhesion complexes, an important factor in mechanotransduction. β-catenin exists as part of the adhesion complex, bound to E-cadherin and α-catenin, at the cell membrane. 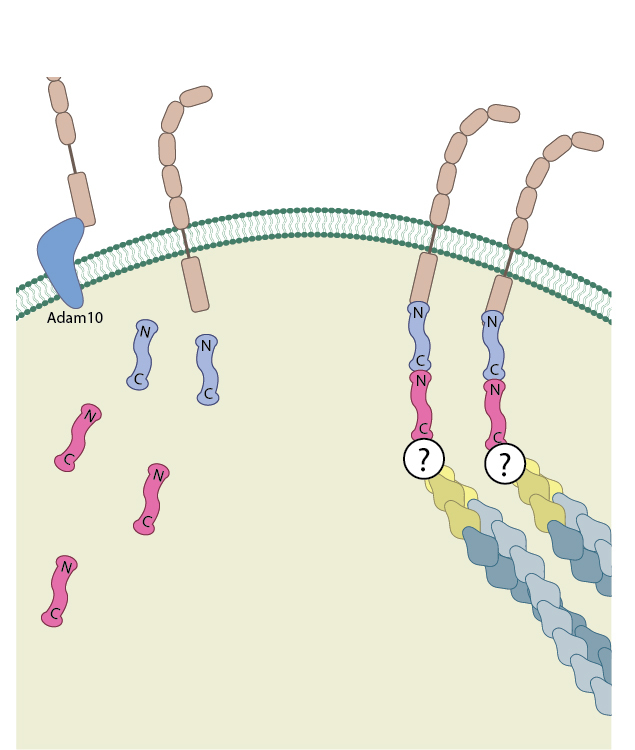 Disassembly of the adhesion complex by proteases such as ADAM10 releases β-catenin into the cytoplasm. Free β-catenin is present in the cytoplasm following the disassembly of adherens junctions or cleavage of cadherins by proteases such as ADAM10 (A Disintegrin And Metalloprotease 10) . However, due to the activity of a ‘destruction complex’, the cytoplasmic concentration of the protein is usually low. In this case free β-catenin is targeted by the scaffolding proteins APC and axin as well as the serine/threonine protein kinases CK1α which phosphorylates Ser45 and GSK3, which subsequently phosphorylate Thr41, Ser37 and Ser33 . This phosphorylation primes the protein for degradation via the ubiquitin pathway . Due to the activity of the destruction complex the majority of β-catenin exists in complex with other proteins. When bound to cadherin, an interaction that is established in the endoplasmic reticulum before release into the cytoplasm, the two proteins protect each other from degradation. Not only is β-catenin protected from interaction with components of the destruction complex, but cadherin is protected from degradation when β-catenin prevents ubiquitin ligase from binding to its PEST motif . The β catenin destruction complex can also be inhibited through the activity of Wnt proteins. In this case formation of an LRP associated Wnt ‘signalosome’ prevents GSK3 mediated phosphorylation of β-catenin . The exact methods by which β-catenin translocates into the nucleus remains unclear. However, it has been established that its amino acid sequence does not contain any nuclear localization signal sequence, and translocation occurs independently of classical importin/karyopherin driven nucleocytoplasmic transport. Instead, transient interactions between the ARM repeats R10-12 and components of the nuclear pore complex are believed to transport of β-catenin through the nuclear envelope . Inside the nucleus, monomeric β-catenin forms complexes with various transcription factors to activate the transcription of various Wnt/β-catenin target genes. This is essential as β-catenin itself does not contain a DNA binding domain . Helix-C, which lies after the 12 ARM repeats but before the C-terminal domain, was found to be essential for many of the interactions involved in the establishment of a transcription complex . One of the primary transcription complexes is the LEF/TCF–β-catenin complex involving Lymphocyte Enhancer Binding Factor (LEF1) and various T-Cell . 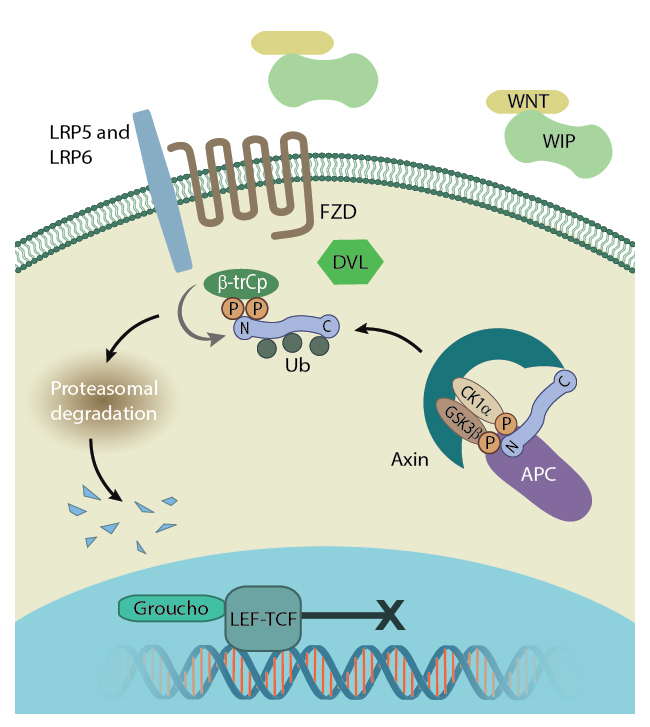 When the cytoplasmic concentration and nuclear translocation of β-catenin is low the transcription repressor Groucho interacts with LEF/TCF . 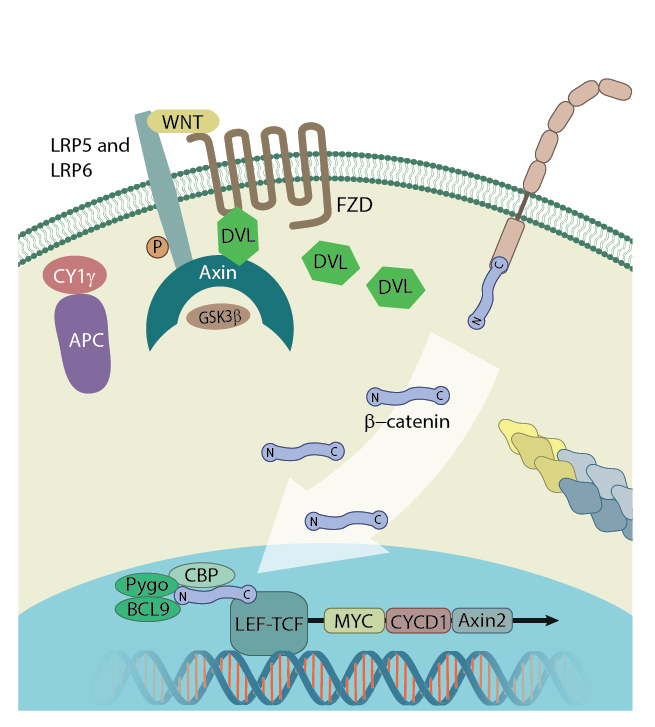 As β-catenin enters the nucleus as a result of the Wnt signalosome activity, it displaces Groucho and interacts with various co-activators such as BCL9 to initiate transcription . Intracellular signaling cascades mediated by the Wnt family of secreted signaling proteins play an essential role in regulating a number of cellular functions, such as proliferation, differentiation, adhesion, survival, apoptosis, and so on. Of their myriad signaling functions, Wnt ligands have been extensively researched for their regulatory effects on early cardiogenic events, during which the linear heart tube is transformed into a multi-chambered heart structure. Both the canonical and non-canonical Wnt signaling pathways contribute to the various stages of embryonic heart formation, confirmed by the expression of multiple Wnt genes, including canonical Wnts (Wnt1, Wnt3a, and Wnt8), and non-canonical Wnts (Wnt5a and Wnt11) within the precardiac mesodermal cells  as well as within the cardiac tissues of the developing heart . However, the relative contribution of either of these pathways depends on the organism or model system and the developmental stage under study. In the case of canonical Wnt signaling, the canonical Drosophila Wnt gene wg functions as an inducer of cardiogenic gene programs  on one hand, while, on the other hand, the presence of Wnt inhibitors Dkk-1 and Crescent that disrupt Wnt/beta-catenin signaling trigger cardiac development in Xenopus embryos . A similar down regulation of canonical Wnt signaling during cardiogenic induction was also observed in chick embryonic explants . Alternatively, canonical Wnt signaling led to upregulated cardiac differentiation in embryonic stem cell lines . Furthermore, a number of studies have demonstrated a biphasic effect of canonical Wnt signaling on cardiac development in Zebrafish embryos- during the pre-gastrula stage it promotes cardiac differentiation, whereas, during the gastrula stage it negatively regulates heart formation . In vertebrates, some non-canonical Wnt ligands have also been identified as important molecular signals during cardiac development, with the most prominent of them being Wnt11. In this regard, several studies using quail, Xenopus, and mouse embryos have highlighted the functions of Wnt11 in promoting cardiac tissue formation, by inducing contractile activity within the tissue, and also in determining cardiomyocyte differentiation into ventricular lineages . The involvement of another closely-related Wnt ligand, Wnt11R, has also been reported in Xenopus embryos, with signaling in both cases occurring in a JNK-dependent manner . In agreement with such findings from vertebrate embryos, Wnt11 signaling is also known to guide both embryonic stem cell and adult somatic cell populations into cardiomyogenic lineages and therefore serves as a potential candidate that can drive the in vitro generation of cardiomyocytes for use in cardiac repair . How does the heart form? What is the role of mechanics in cardiac development? What is epidermal growth factor receptor signaling?